Join other young women for a week of engaged discovery. Learn about the opportunities available to you in business from accomplished business women. Develop your leadership and teamwork styles. Realize ways to make a difference through entrepreneurship and social justice. Envision your future as a leader who will change the world, for good. The WashU BOLD@Olin program will immerse you in life-changing opportunities for learning, networking, and personal growth. You’ll learn from Olin Business School faculty, network with current students, gain experience working on case studies, and discover the many areas of study—majors and minors—available at WashU Olin. 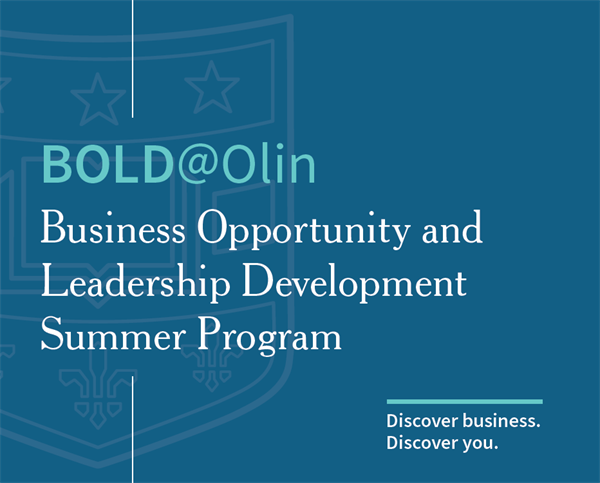 If you are a rising female junior or senior in high school who’s motivated to discover more, apply for BOLD@Olin. Sample the college experience at WashU Olin and feel empowered to make your impact. Program cost includes housing on campus, all scheduled meals, program materials, and off-campus activities. Participants will be responsible for their own travel costs. The program cost should not be a barrier to your ability to attend. A limited number of scholarships will be available for students who demonstrate high financial need (defined as a household income of $75,000 or less). Scholarships will cover the program cost as well as a travel stipend. More information can be found on the program application. One letter of recommendation from a high school teach or administrator. Please have your reference email their letter directly to OLIN-BOLD@email.wustl.edu. Applications will be available February 1, 2019 and are due by April 1, 2019. An application to Washington University is not required and admission is not guarateed.